At Vision Elevators, we strive to bring the most advanced technology to our residential glass elevator. Our elevators add functionality and style to your home. Our residential glass elevators have practical use, enabling you to have up to four stops in your home, and will complement your room with a 360-degree glass view. With a sleek see-through design, our elevators will not overwhelm your room. We offer two different types of lifting mechanisms for our elevators, pneumatic and cable. Pneumatic vacuum elevators operate by using air pressure. The cab has a vacuum seal built into the top of it. Turbines located at the top of the tube draw air out of the tube above the cab, pulling the cab upward. At the designated level, the steel brakes secure the cab to the landing. When the cab descends, the turbines come on to lift the cab off the brakes and then turn off to allow the cab to drift slowly down the tube quietly. Cable driven elevators use a motor and drum unit at the top of the elevator shaft. Two cables are used to connect the drums to the cab. The drums wind the cable up in order to raise the cab up. When the cables spool out, they lower the cab back down. Vision Elevators offers three pneumatic and two cable driven models. The different models range in size and capacity. 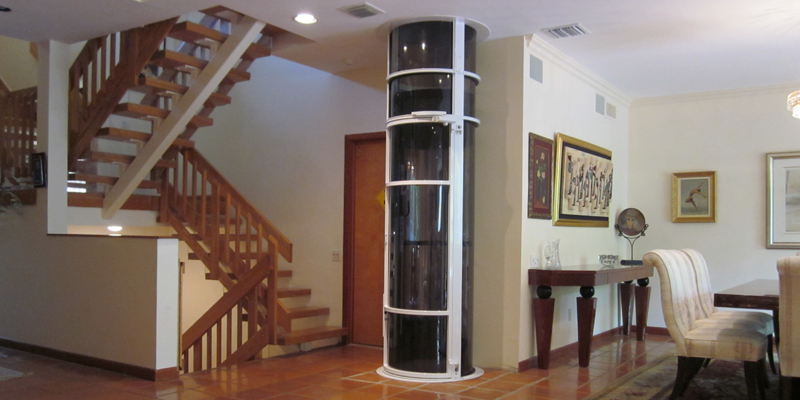 The Vision 350 is the smallest elevator offered and is great for a room of any size. It is pneumatic and requires minimal construction. It is 30 inches in diameter and has a 350lb capacity. The Vision 450 is the most popular model we offer. It has a 47 inch diameter and has a 450lb capacity. This pneumatic elevator can hold two people and the panoramic glass design makes for a great view. The Vision 550 is still compact but has the advantage of being wheelchair accessible. With its 52 inch diameter and 550lb weight limit, the Vision 550 adds a new dimension for independence and mobility inside your home. The Visi 48 is a cable driven elevator with a 48 inch diameter and 744lb capacity. It is offered to both residential homes and commercial buildings. One of the more unique elevators, it has an octagonal design that makes for a beautiful view inside and out. It can also be used in commercial buildings but is then limited to two stops. The Visi 58 is also cable driven and has a 58 inch diameter, along with an 830lb capacity. This is our largest elevator available and does not need a pit or machine room. 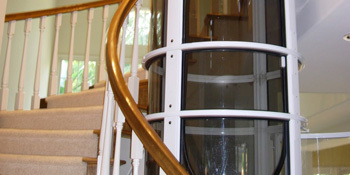 If you are looking for a practical way to enhance the mobility inside of your house while adding style and looks, a Vision glass elevator is the best place to look. 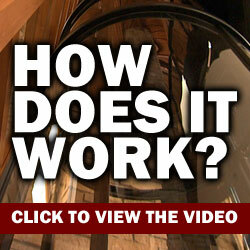 With several different models and affordable prices, we want to get an elevator in your house.